The last few days have been absolutely gorgeous. So gorgeous that it feels like summer is just around the corner! The weather has been in the high 60s and low 70s since Thursday; we spent nearly the entire weekend outside. Last Spring, it was still snowing in April so this is pretty exciting! 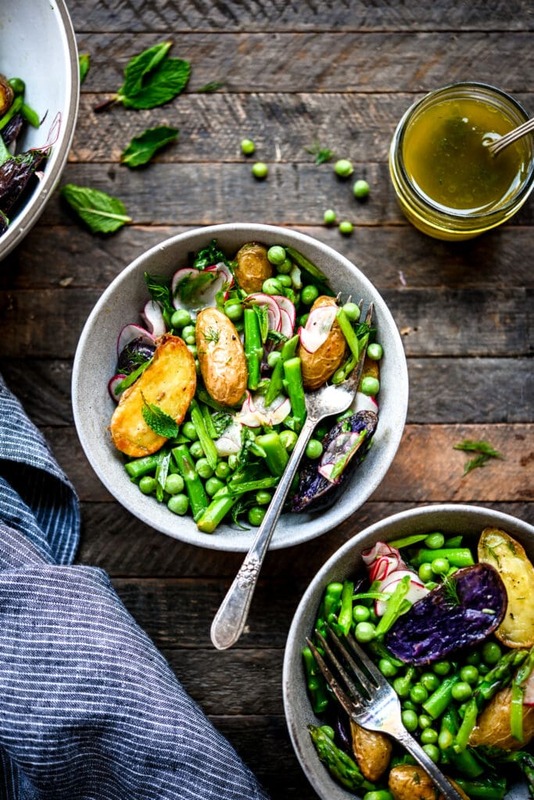 Warmer weather means we’re craving refreshing salads and produce. 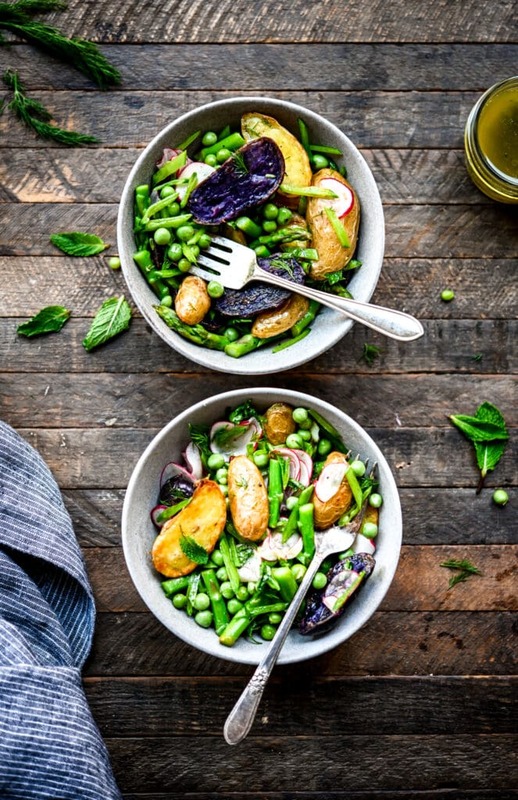 This Spring Potato Salad with Asparagus and Peas totally hits the spot! 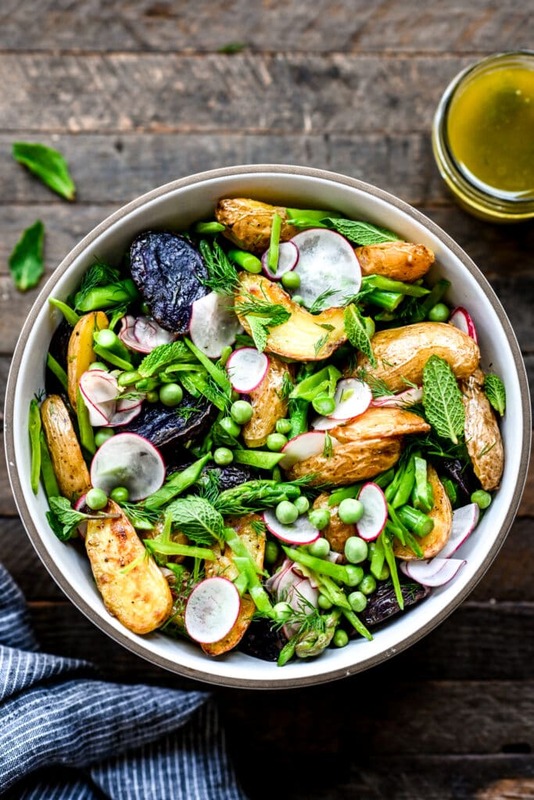 Roasted multicolor fingerling potatoes are the perfect size and texture for this salad. They get nice and crunchy on the exterior and don’t get soggy when tossed in the dressing. 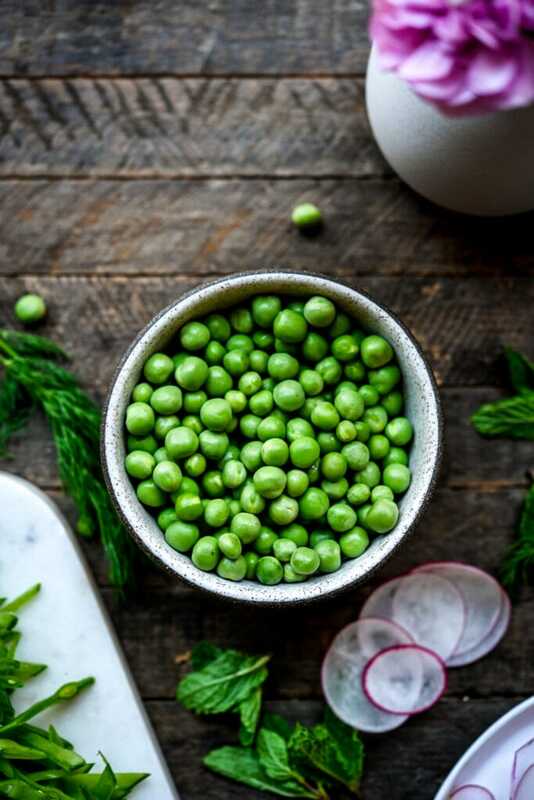 In addition to the roasted potatoes, we tossed in some thinly sliced radishes, fresh peas, asparagus and fresh dill and mint. I absolutely love dill (it’s my favorite herb! ), so I always add a few extra sprigs to my salad. In addition to using regular shelled peas, we also added snap peas sliced thinly on a bias. They add a perfect crunch! 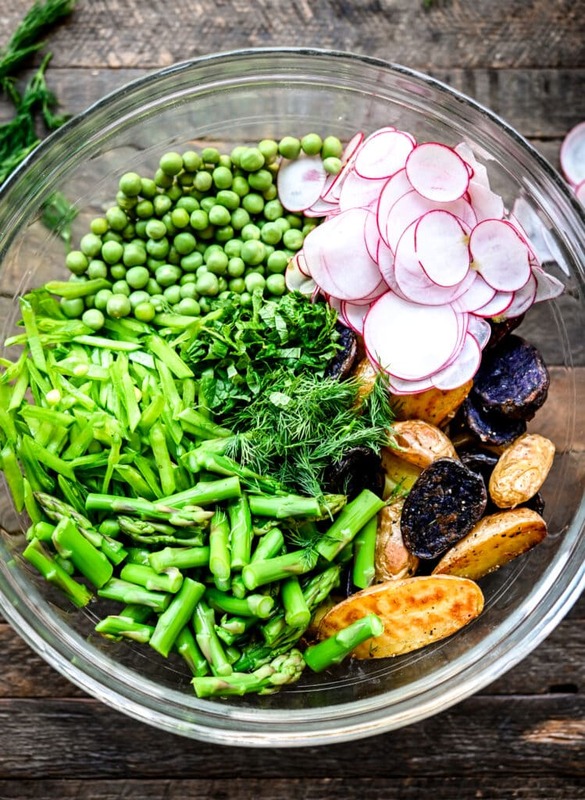 We were inspired by this gorgeous snap pea salad from Bon Appétit – such a creative use of peas! 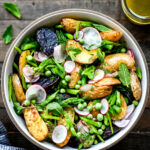 Last Spring, we shared a similar recipe for a Roasted Purple Potato, Asparagus and Pea Salad. Instead of a light vinaigrette, we made a creamy vegan mayo alternative, so it’s much more similar to a traditional potato salad. This version is much lighter and more refreshing with a citrus dill vinaigrette. You could even serve this over a large bed of greens (arugula would be fantastic!) if you’d prefer. 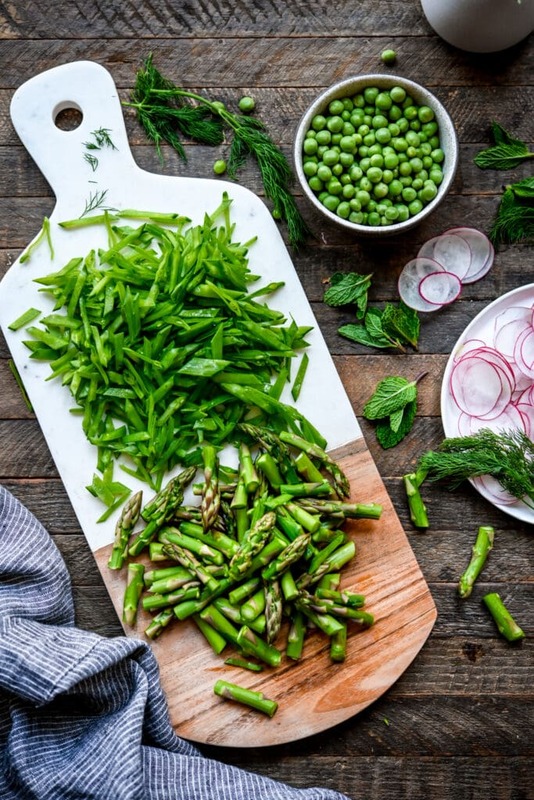 This is just the beginning – we have a ton of new Spring recipes coming to the blog in the next few weeks! Highlights include an Herby Whipped Tofu Dip, a Vegan Frittata with spring vegetables and an insanely delicious Lemon Almond Raspberry Layer Cake (also vegan and gluten free)!